Last month was the exciting season opener at Sebring International Raceway. Now the paddock has stayed in the US for round two of the NEO Endurance Series. 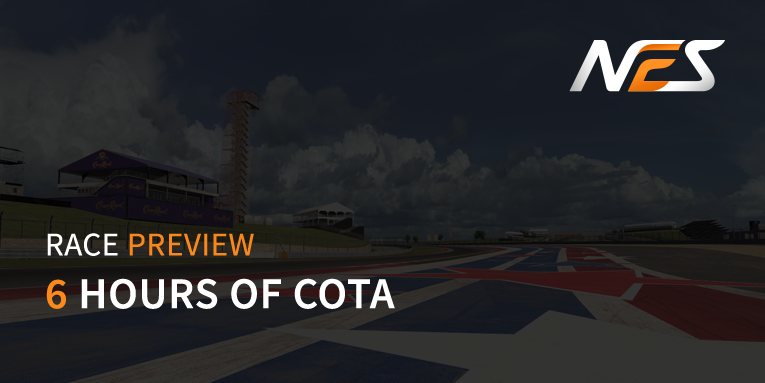 Round two is at Circuit of the Americas in Austin, Texas. Last year it was Foracer Coanda Simsport who won in the prototype class. In the GT (now GT2) class it was Fenix Motorsports who took the top step of the podium. Also this year these two teams are the favorites for the class victory. In GT1 class it is hard to pick a favorite. The official entry list will give a detailed view of all teams and drivers. Also don’t forget the spotter guide made for the teams, broadcasters and the viewers. There are multiple ways to watch the race. As usual NEO has a live timing page with the stream, live timing and race updates. New for this season is that the races are also broadcasted on iRacing Live as well. To stay up to date, follow @NEOendurance on Twitter and like our Facebook page. Join the conversation on social media by using #iRNEO. 17:00 21:00 Free practice 1 240 min. 21:00 01:00 Free practice 2 240 min. 01:00 05:00 Free practice 3 240 min. 13:00 16:00 Free practice 4 180 min. 16:00 16:20 GT2 qualifying 20 min. 16:20 16:40 GT1 qualifying 20 min. 16:40 17:00 P qualifying 20 min. 12:00 14:30 Warm-up 150 min. 14:30 15:00 Setting up the grid 30 min. 14:40 14:50 Drivers briefing 10 min.